• Hard Shield: Highly protective front plate. • Single Front Closure Plus Attached Ankle Guard: Adjustable guard width and ankle protection. • EVA Backing: For high comfort and durable cushioning. • Soft Synthetic Lining : High comfort. • 95% polypropylene / 5% thermoplastic gum, injection molded. 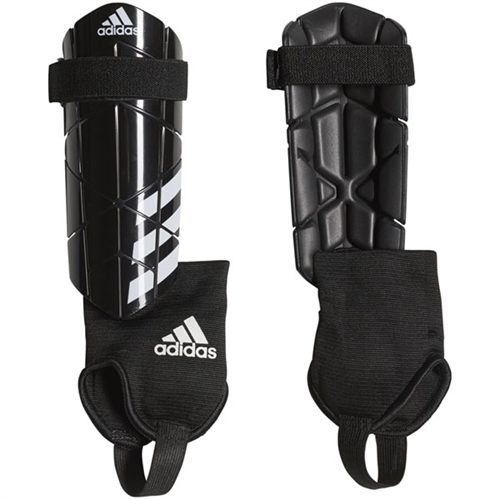 Shinguard SizeXS: 3'11"-4'6"/S: 4'7"-5'2"/M: 5'3"-5'9"/L: 5'10"-6'1"/XL: 6'2"-6'5"
NOCSAE Standard By HeightXS: 3'11"-4'6"/S: 4'7"-5'2"/M: 5'3"-5'9"/L: 5'10"-6'1"/XL: 6'2"-6'5"
Our adidas Ghost Reflex Shin Guard helps reduce potential injuries from aggressive sliding tackles with the adidas® Ghost Reflex Soccer Shin Guards, featuring an adjustable front closure and attached ankle strap for an ideal fit with total coverage.